Whew weeeee. What a weekend. It all started when I went to the beauty parlor on Friday. Here I am resting after Saturday morning’s fundraiser garden tour. What a handsome profile, yes? Thank you Godmother Carol. I feel like my old self again. See, I had to get beautified for the bicyclists who were touring five gardens to benefit VCU Massey Cancer Center that morning. Can you believe my garden was one of only five invited to participate? Well, I guess so with my magnificent snoopervising. Without me to help, the peeps couldn’t keep a garden all nice and neat. They try. Bless Them. Anyroo, over about two hours there were maybe 120 people who came to see me and my garden. I held court, of course. And I gave little tours. I showed them my favorite places. Including my pass-through under the fence to Sniglet’s house. OH….. Did I tell you? Sniglet is coming to stay with me while her peep is away. She’ll be with me for DAYS and I can’t wait. WEEEEEEEEE! Woooooot! That’s another reason I had to get beauty-fied. 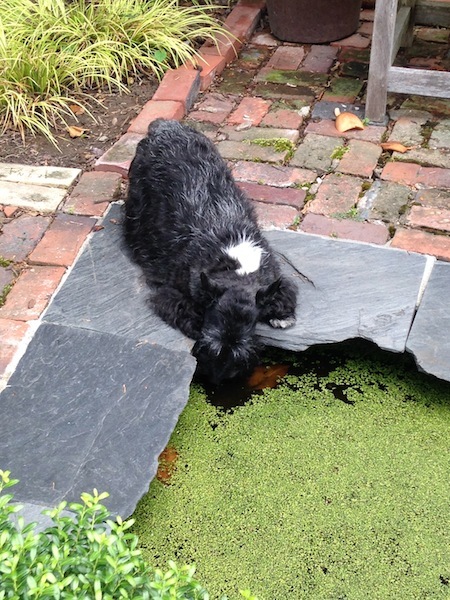 It was so hot on Saturday, I had to take a break from the garden tour and sip some water out of one of my little ponds. The peeps hate it when I do that. They say the water is nasty. But – it’s the funniest thing – whenever I remind Them that I like to wash down the kitty bon bons that I like to eat, They stop worrying about the nasty water. Wonder why? OK. Back to work. Gotta get the house ready for Sniglet. She’s coming on Friday. It’ll be another whirlwind weekend for sure. I have a nice garden. Sometimes I let people come see it. Saturday, lots of people came to see it. But mostly, I think they came to see moi. My gal pal Sniglet is coming to visit for a while. I’ll tell you all about it. OH….on Saturday, I think I was in Manhattan, like many of you guessed. But I’m really not sure. Thanks for playing along! 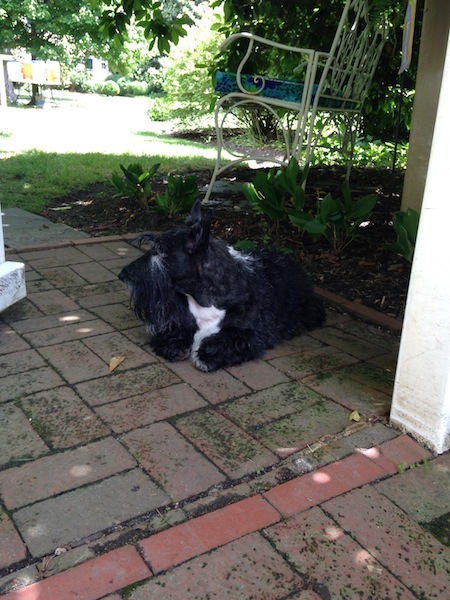 This entry was posted in The Scottie Chronicles and tagged animals, dog grooming, dogs, gardening, pets, Scotties, travel, VCU Massey Cancer Center. Bookmark the permalink. No, They didn’t. They think it’s yukky. Silly peeps. LOL….we do need a chaperone! Hey, I’ll have to make you a little movie. Garden tour, why don’t you help me with my garden. Moles I have moles in my garden. I would be happy to help you with your garden by buddy! I love me some moles!!! You are soooo right. I AM the flower of the day aren’t I? You look amazing, Stuart! My peep wishes your Godmother Carol would fix my fur. Am sure all of the visitors loved your kingdom, and most of all-YOU!! Hey, the fundraising folks put a picture of moi on their facebook page. Sweet, huh? Hey, my Godmother will be happy to fix your furs. Tawdle on over to my place and we’ll walk over there together. Of course you left some presents under the bushes for the garden tour to appreciate. Scottie bon bons-how cute. Don’t you KNOW I did!!!!! Shhhh….don’t tell my secrets. I think there are ‘gators in the pond. That looks like ‘gator territory to me. Yeah, one of these days, my snoot’s gonna get bitten. Ouch. We all got beautified this weekend, too! You look marvelous! Show us your garden tour, we’d love to see how your snoopervision paid off. Did you give out pawtographs and kisses? You and Snoget will definitely need a chaperone. Snoget. That’s a riot. I can’t wait to tell her she’s been renamed. ROFL….. I do my best. It ain’t easy. But I try. That was busy and about to get busier!! You ain’t kiddin!! How’s by you these days? Gotta pop over and see you. A Sniglet stay! How wonderful! That does it. I’m heading south to see you guys. That does it. I’m heading south to visit you guys. We’re sure the Peep’s garden is just lovely, Stuart, but we think you’re the reason there was such a large crowd! You’re the main attraction! With your good looks, charm and scottitude, yup, it’s because of you! Now you are REALLY making me blush. But you can’t tell for my furs. We hope that you didn’t do anything to embarrass your peeps. Your garden is beautiful. Enjoy Sniglet. HA! No. I behaved myself. You look very handsome, why would people want to look at a garden, when you are there to admire?! I bet Sniglet will be bowled over when she sees your handsome mug! Now, that’s a good question. What more can you ask but ME? Ya sure do look great. The event raised $10,000!!!!! Wooooot! We love it when that happens. Oh thank you my friend. We should put on a show together. What a hoot! And Houdini, too! So excited you pal is coming for an extended visit! Y’all have fun, hear? I’m sure I’ll have a gazillion things to tell you about. I”m sure we’ll have a gazillion things to tell you about! That’s a lot of people going through your garden, Stuart! Your new ‘do looks great, by the way. Hope you enjoy your time with Sniglet! Much love, The Scottie Mom.